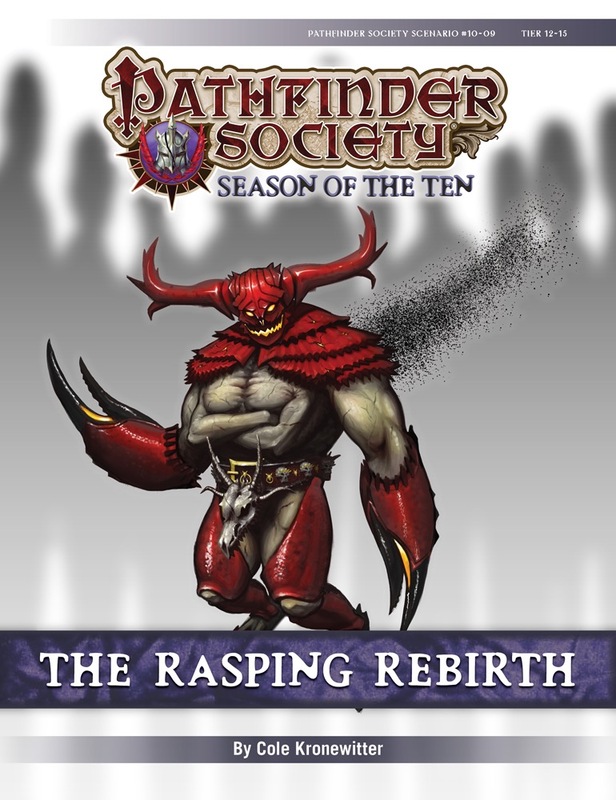 A Pathfinder Society Scenario designed for levels 12-15. It's really epic. Only the endings (!) of some of the sanctioned Adventure Paths can match the scale and spectacular. A beautiful fighting scenes, worthy of Hollywood blockbusters; a difficult choice of Jedi/Sith style actions; one of the coolest chronicle sheet that I've seen. It's here. Definitely play and have fun. That's what you are looking for in 'seeker games'! Incredible challenges, interesting plot dilemmas and as you expect at this tier some truly epic set piece fights. What about Gamin though man! You bring back Koth'Vaul and give Gamin a chance to confront the beast and you blow it! I was really hoping for some kind of seeker upgrade for the blade here. I rarely take the time to write reviews as most scenarios are just "meh" and are quickly forgotten as background noise... This is not one of those. Its hard to write high-level content that feels seeker worthy; this is an example of how to do it right. The storyline can't get much more epic than this, the players will feel like they are actually doing something worthwhile. The players choices actually matter and effect the world permanently. The combats aren't just a random collection of high CR monsters, but rather each one is unique, moves the story forward, and will challenge even optimized parties. For Players: I recommend playing 9-25 and 10-09 in that order for storyline continuity. These two scenarios could have been a Part 1 and Part 2 if they were in the same season. This scenario also is the finale for one of the longest running plot lines in society play. Players need to be on their toes... It's one thing to fight a few demons that show up on the material plane; its a whole different ballgame when you walk into THEIR house. While my party did survive, I can EASILY see this scenario TPKing non-optimized/non-balanced parties. GMs: Go read the GM thread, follow TACTICS. Plan for it to run LONG. Paizo: It's probably too late, but this author needs to be hired to write more seeker content before PFSv1 ends. TL;DR - This scenario is EPIC (have I mentioned that already?) This is must-play seeker level content, and rightfully takes it place in my top 5 scenarios of all time. I hope the author had a performance bonus clause in his/her contract, as this was knocked out of the park. A must-play for seeker level teams. This scenario sets the bar for high level play. Not society play. Any high level game. I've always thought of high level play as three balancing acts going on at once. First the story must keep up with exponential growth in the powers the PCs possess. Then something new needs added to make each encounter unexpected -- in lower tiers it is swarms and oozes, then DR, SR, immunities and so on -- just something to keep the players from feeling that they have it all figured out. But the hardest aspect, the last thing that a great GM weighs out in planning a scenario is how to create a rewarding feeling after a real struggle or even a defeat. This scenario more than exceeds the DCs of these checks. It has features that surprise and enhance the powers the PCs arrive with without overshadowing their characters. It makes each fight feel like victory is always just out of reach. The premise ties in several major and minor plots from previous seasons but also follows nicely from the end of Betrayal in the Bones. It is by no means a snipe hunt or picking up a McGuffin. The table I ran had players engaged in the role play before the introduction even finished. On the minutiae, the appendix is very helpful to speed up prepping, please continue printing these. The level, table size, and difficulty adjustments are very precise and crucial to prepare. If at all possible, know these in advance in order to internalize them. Also, follow the tactics as written. CR is wibblier and wobblier the higher it goes and careless reading as a GM would easily result in disappointed players. The first combat is reminiscent of a fight with an alien race that rhymes with Yerg. I used 9mm pipe cleaners to represent the legs of the creature that couldn't fit on the map, but even without that the visual of fighting such a creature is inspiring. A statblock was not provided for this creature, so I recommend creating one for the Eternal Hive just to make an easier reference in combat. Tactics for un-burrowing creatures are fantastic, be sure to follow them! I used a handout for the bonuses for the second combat since the time between arriving in the area and combat beginning is very short. Note that the Epic DR is most useful for natural attack creatures since it allows them to bypass part of the Curators own Epic DR. I've always felt that this rule was buried too far, but it must not be neglected here. Describing how the enemy is being damaged each round also helps the party decide on strategies. Our party retreated (a true feat for them!) in order to buff without which they would have been stopped dead in their tracks. The last fight frustrated the players more than anything as the go-to demon binding spells failed due to the followers. When this was realized, their opinion of the followers got ugly fast. I based the choice of melee tactics for the enemies on a desire to tear the PCs limb from limb, which helped it feel like the glabrezus were not pulling punches when they were not spamming spells from across the map. The bonus effect in this last combat does not have the clearest rules, but reading closely, it seems to be a party benefit that occurs at the start of each round with everyone rolling at once and one effect following the results. Players, make your GMs run this scenario. GMs, make your players enter the abyss. Just double-checking my understanding of the high-level stuff: because there are no pregens of that level, you’d need 4 players with custom PCs to run this, right? Correct. No pregens can be used in Seeker content. I'm tempted to buy this just on giddiness. Hmm, I wonder if we will be finished high tier hard mode Breaking the Bones PbP before this releases? Hoooo boy. I am glad I opted not to play Betrayal in Bones, the fact my Demon Hunter/Mendevian Sergeant is still in tier for this makes me giddy. I am so excited to get the band back together for this. And that I made KV a nemesis for the party ranger. I'm in a group just starting to go through All For Immortality tonight, and once we wrap that up doing this should push us all to 15.2, perfect for letting (any of) us (who want to) make our way up to 20th. Nice send off to standard PFS play. Hoping to get my hands on this soon. Anyone else having trouble reporting this for Society? Not this in particular, but I've been having trouble reporting anything for Society for about four months. I'm honestly kinda confused now: SO wait, Deskari is officially dead dead? I mean, don't you need to kill demon lords twice and AP itself doesn't make assumptions about whether Deskari is perma dead or not? The AP does not make assumptions, but the devs have decided what assumptions they are working with going forward. Just finished playing it, and it's definitely my new favorite scenario, with combats as epic as its story. I played the module this weekend at a convention. Since we had a great time overall, I decided to write a battle report/review of the module from a player’s perspective. Perhaps this will be of use to someone looking to run it soon or and/who is just curious about player feedback and one possible runthrough from the player side. I have not read the module myself and can currently only share my experiences, plus some bits the GM told us about the module after the adventure. Spoilers abound, obviously. I heavily recommend not reading it if you’re about to go into it as a player. Rogue 10, brawler 4 (? ): our resident stealth specialist/melee striker. High on damage and debuffing enemies per hit with debilitating injury. Arcanist 14, heavy control/mobility setup with some added nuking spells. Able to hard lockdown both single and groups of enemies. Cleric 14, heavy control channel setup, spreading stacking fear debuffs and disease with the Urgothoa alternative channeling rules. Able to hard lockdown anything, but especially groups of enemies not immune to fear. Paladin 12, bloodrager 1, swashbuckler 1 (me): party tank, melee striker. High on damage, self- healing and some utility from use magic device. We ran the module on high tier with the 4 player adjustment, without the hard mode. If we had been level 15, we would have ran it with the hard mode. The above party played together throughout the eyes of the ten arc and unleashing the untouchable. Also, all 4 of us ran betrayal in the bones separately. We were very tuned to the other players’ strengths as a team and I think the overall level optimization across all characters is high. The only real obvious weaknesses the party probably had beforehand (IMO) is that our ranged damage capacity is a bit low, completely relying on the spellcasters to land spells or the melee characters to fight with their backup weapons, and that both melee characters did not innately have permanent flight solutions, meaning on every fight with flying enemies we’d normally have to at least use the first turn to get the melee into the air. In previous fights, we tended to get around positioning problems for the melee fairly well by the arcanist just teleporting the melee into position. After some funny roleplaying in which my paladin had been accused of heresy against his own church sprouting from typical paladin denseness over the last 14 levels, and his rogue paramour successfully arranging him to be broken out in stylish fashion, we heard the mission briefing and buffed all long term buffs. Since we supposedly had one day to prepare, this allowed the caster to use extended spells which lasted over a day to save spellslots while the buffs were still on going into the abyss. I.E., all our weapons had been buffed to +4 by the arcanist, we had heroes’ feast, a spell which gave everyone the ranger’s favorite enemy and terrain at +2, and life bubble. I used extended reach’d shield others to direct half of everyone’s damage taken to myself if they were within 190ft and a scroll of overland flight, which by all the gods was the best possible last minute purchase I could have done. -We got the message from the dying paladin and were very suspicious of this, also considering the arcanist made some knowledge checks concerning the BBEG, his nickname and his tendency to lie. Why would the BBEG tell his mortal weakness to the paladin and then just leave him there? However, we were not thorough enough nor skilled enough in heal to pick up all the hints. Thus, while it was suspicious and we were aware of this, we did set out to find the McGuffin scythe. The description of the hive was suitably epic and really installed a sense of dread, as was the description of the abyss itself. The sheer size of the hive on the map was also a bit terrifying. No one had dungeoneering as a skill so we had no information about the enemy going into it. We also didn’t do anything special to hide our approach so we didn’t catch it/them unaware, if there’s been an option for that. I won initiative and started with good hope as a party buff, then smite evil on the projected image. This made the GM wonder if that would stick or not and he ruled it didn’t, but he rolled a willsave for me which I succeeded on, which gave away it was an illusion of sorts. Obviously, being the intellectually-challenged paladin I had no idea what that meant but passed it along to the others anyway. The hivemind was next, casting cloudkill (ineffective due to life bubble) and a quickened dispel magic on me. He rolled low on the second and, somewhat hilariously, since my caster level was also low (9) the three active shield others actually protected overland flight from the scroll (also CL 9) against the dispel, since one of the three ate it instead. This would turn out to be vital for the rest of the adventure since I still had active flight on at all times. The cleric was after this and could see through the fog with gauze mask, and dispelled the image with CL19 dispel magic. He also channeled and found the two legs of the hive that had tried attacking us (both missed) could be feared and were vulnerable to AOE. The arcanist tried casting a spell at the hive and hit, but the hive was immune, since we didn’t know yet it was swarmlike in traits. The hive then successfully ate the arcanist with his freedom of movement having no effect since it supposedly has auto swallow hole without needed a grapple first. The hivemind then mazed him away, breaking his Shield Other. At this point, the rogue (who was small and ‘riding’ on my shoulders) and I flew in to engage the hivemind inside the hive. We then ran into an issue: the hivemind is supposedly immune to everything a melee or non-caster character could possibly to do it, which meant the both of us were pretty much useless for the entire encounter. We’d taken a few actions for the rogue to attach the swarmbane clasp to my shoulders, but it was ruled that this wouldn’t work since the hivemind is not a swarm but rather a Worm that Walks. Is this intended? Because if it is, I really do not see how a party lacking a full caster or a blast specialist could win this encounter; it is essentially invincible to any kind of weapon damage. Well, knowing the thing was invincible to us we rather tried getting the scythe followed by the only possible plan of fleeing. On the rogues suggestion I, as the pilot, flew up to it, had her grab it and would then attempt to run out. The rogue got blasted by the trap (didn’t check for it) but made her save, the remaining 75 damage was split between us due to shield other. Meanwhile, the arcanist used some buffs/chronicle buffs to boost his int check for maze and got out the following turn, while the hivemind and the bug outside went for the cleric, who was the only one still outside. It was rules shield other would still work on her, since there would probably be at least a tiny hole to see through within the swarm of bugs the hive was made of. Since the bug on the ground lacked a way to see the cleric, who had been hiding in the cloudkill conveniently given him by the hivemind, he flew up to her, wasting one turn. The cleric now found herself surrounded by the hive legs, the hivemind and the bug, but that’s where she wants to be, surrounded by channel targets. 3 channels later, the hive was panicked with the two front legs dead, the hivemind was fightened, and the bug outside was also frightened. The hivemind then teleported back inside, where the arcanist cast feeblemind on the hivemind and it failed the save. Some hilarious imagery followed of the huge hive running for its live from the puny cleric outside. However, this left us with another problem, as the Hivemind then just started hiding inside the hive, and we had no way to get to it. Eventually, the GM rulled that the melee characters were allowed to attack the swarm from within to speed things up and because he couldn’t see how you’d otherwise would be able to get out of the thing once you were inside. Two turns of attacks later, we killed it, looted the body and moved on. The cursed scythe was identified, remove curse was used by arcanist point and we used a carriage to quickly get us to the correct site 2. -Doesn’t pull punches with spells like maze being used. The bug or bugs outside are supposedly also quite deadly with their eye rays and attacks, though the only one that was present due to 4 player adjustment couldn’t do much in our case. -Enemy is essentially invulnerable against non-caster PC’s if the above claims were correct, which in a random group setting like PFS seems like a major design flaw to me. Coupled with some mechanics in the next encounter, this was made even worse since the rogue essentially got to do (almost) nothing in 2 out of the 3 combats we were in. -On the other side, there seems to be some anti-synergy on team badguy between the two enemy types, with the large bugs outside unable to see targets inside the fogcloud made by cloudkill, thus also unable to engage them effectively. We fortunately made the knowledge check and travelled to the correct place, with the cleric again passing the check to not get sidetracked. Upon leaving our chariot, we lost initiative to the demons who used their mythic initiative hacks. Their turns were used moving into melee range, quickened dispelling a random target (the arcanist, who again lost Shield Other to this (a recurring theme by now) and attacking a random target (the arcanist), ending him in the swarm. His charm prevented him from being grabbed though which allowed him to fight on normally. I think the demons then immediately used their AOE Daze attack, but it might have been later in round 1. All I remember clearly is that the rogue never got to take her first turn. I barely parried an attempt to sunder an enlarge potion I drank and 5-ft flew myself in between the party and the demons. The cleric used her fear/disease channel 3 times and very quickly drained the enemy’s mythic points due to the amount of willsaves they had to make, also blowing up the swarm heading our way for one turn. Then the arcanist paralyzed one demon with chains of light, which the enemy barely failed the save of thanks to the cleric debuffs. The rogue unfortunately failed her willsave against the AOE daze effect and although the GM only rolled a 2 on the 1d10 (!?) for the daze rounds, this effectively locked her out of the fight. This was understandably really frustrating to her, since the two of us as melee/non-casters had been fairly useless in the first fight due to a semi-invicible enemy. That there were now also multiple shots of a pc being stunlocked the entire fight before your first turn even came up was a bit hard to swallow. Well, round two started and I was now adjacent to a paralyzed demon, so one auto crit later, it was dead. The other adjacent ally had tried a disarm as an AOE against me when I did the coup the grace, but another parry easily deflected it due to smite evil on the second target. Since the demon did not have improved disarm, this in turn provoked from me which was somehow also a critical hit. The resulting 180-ish damage along with chip damage from the cleric channels and a finger of death (save was succeeded) from the arcanist then killed the remaining demon somewhere mid round-2. Overall, this fight had gone extremely well for the party thanks to a number of good rolls from us, though it was a bit soured by a sense of how unfair this module had been to none-casters, especially to general melee characters without permanent flight and very high willsaves (which I did happen to have, lessening the blow to my paladin, but which not every character will have access to). The rogue effectively hadn’t gotten to do anything in either the fights or the skillchecks outside of the fights (which all seemed to be heal, survival and knowledge checks) even though we’d been in the module for about 4 to 5 hours now. -Getting ambushed by mythic monsters instills a good scare. -Enemies stealing items automatically on attacks is a fun idea. -Seemingly very unfair and unfun design towards melee characters, especially those with only decent willsaves and/or non-constant flight. Having multiple decent chances to be stunlocked for the entire fight every round, even before your turn comes up due to enemy mythic initiative, IMO is not good game design. Also on this note, it seems like every monster in the module was flying every encounter and had at least 15-ft reach, which adds to this problem. It is also really frustrating to get this setup after the first encounter with the hive, in which the non-casters are apparently expected to sit by and watch as the casters have to win the encounter by themselves(?). -Having your items stolen is something which could make for a lot of on the fly recalculating of character sheets, which can slow down the game a lot. Lots of fun roleplaying here in bargaining with Deskari. Eventually, after great deliberation (knowing full well he would lose his character and that it would mean the end of our merry band of 4, though finding it an extremely cool and fitting end to the character which no one could blame him for – I’d probably have done the same thing in his case :) ), the cleric of Urgothoa decided to eat the full heart whereas the rogue and the arcanist simply stole some blood to use. As the very dense paladin, I was facepalming throughout the entire thing. I Imagine what happened IC was that the paladin walked up and defiantly rejected the deal, fully expecting his boon companions to follow his example, only to slowly turn around and find them all gorging themselves on dead demon god essence behind his back. Fun times! I received an out of character warning from the GM that even stealing the blood from Deskari was fallworthy for a paladin, even if only done specifically to combat the BBEG. Personally I appreciated this since it was fitting and also probably prevented a lot of debate on whether or not temporarily working with an Evil diety to destroy a greater evil would make you fall or not. I might have tried stealing blood otherwise which might have led to an unexpected fall ruling and a lot of discussion or being heavily nerfed for the rest of the module. Anyway, even though I rolled very high the BBEG won initiative and tried to sunder my weapon on round 1. This didn’t do much since the weapon had an effective +7 total enchancement bonus, counting spiritual weapon. I did however get disarmed on turn one and then somehow tripped. Good variety of maneuver use of the enemy I have to say! The demon cleric channeled and found out the cultists were able to use wish-like effects to remove all the penalties he was inflicting to the boss. Then he used his new mythic powers and started flame striking and quickened flame striking the cultists, which had them at exactly 0 HP after his turn. Now the rogue finally had her moment of glory in haste-charging and consequently domino-tripping the five lined-up and staggered enemies. (unsure if that is a legal move, but it was awesome so it was allowed). Meanwhile the arcanist again paralyzed one of the demons and one other was, I think, running away from the cleric in fear. The BBEG won the contest for the abyss in the first turn (afterwards, we won the rounds since we had a lot of Deskari power and had knocked out all the cultists) and used a free action meteor swarm on me. In a move I’m sad to say I’ll never be able to replicate, since the required feat was PFS-banned sometime recently which I was made aware of following the session by another player, I used smash from the air to parry three out of the four incoming meteors while I was prone. They still exploded around me, but hey, it was cool :) The last one hit me square in the face with a saving throw of natural one, and the blunt force + explosions on everyone, half of it redirected to me, did a fair bit of damage. In rounds two and three, the rogue used her second (?) bit of mythic power to get adjacent to the paralyzed demon and then used coup de grace, which finished it. I tried attacking the BBEG but he teleported out after the first attack. I made the blunder there of going after him rather than healing more or buffing up more first, since he wasn’t attacking anything and I was fairly injured. In round three, I ate the resulting full attack/ Mythic extra attack and even a parries of 50,49,48 and 40-ish could not beat most of the BBEG’s rolls, which I guess emphasizes how little heavy ac-investment would have mattered here as an effective defense. It ended with me somewhere around 8 hp and then 50 after my full attack turn which failed to kill him. Out of penache, I was set to be killed by the BBEG the following turn. Meanwhile, the cleric had used dimensional anchor so the BBEG couldn’t teleport away. The rogue then used her last bit of mythic power from Deskari’s blood to get close to the BBEG, barely made the acrobatics check needed to not provoke on approach and got in the last hit at the last possible moment before his next turn, which felt like a suitable cinematic finisher. -The final boss is appropriately threatening and has good backup in the way of the cultists, which can heal or remove conditions from him. -The control for the abyss thing and the resulting free spells was/were cool. -Decent scenery, if not as epic as the other two encounters. -Felt like martial and especially characters could contribute a lot more to victory; the amount of melee hate seemed a lot lower than encounter 1 or 2. This is helped a lot by that I think drinking the blood temporarily gives you both mythic points and a fly speed (? at least, I think I remember hearing this from the rogue), which can then be used to get adjacent to enemies and still full attack, even if they are relatively far away. -There was some decision paralysis on how many spells people got to choose from in the abyss control contest. Given how high level most of these are, it’s very possible players are not too familiar with their effects. Some laughs were had over how the cleric now got to dress up his new home in the Abyss, and we said our farewells. I imagine my paladin would have been shocked to see his ‘virtuous and pious’ friend’s demon transformation to be permanent and finding her not particularly bothered, but hey, he IS really thick and had missed all of the dubious elaborate reanimation schemes the cleric had bluffed her way through during previous adventures. Unfortunately, by then we were a bit tired and had to wrap up the rest of the story, so the ending was paraphrased a bit. Meanwhile, the arcanist had declared that he was getting increasingly paranoid about the rest of the universe constantly getting stronger and more dangerous alongside him, and is probably still hiding in his magnificent mansion away from society. The statues were of an arcanist with glowing chains around him, after how useful chains of light had been. The paladin looked forward with his hand resting on nothingness, since the rogue it was supposed to be on was permanently invisible, even her statue (which was also made hard to recognize for onlookers with see invisibility). And the last statue of the mysterious disappeared fourth pathfinder was never made. We hope to continue the remaining PFS adventures with help from 1 or 2 other characters to fill in for the cleric, who he group will no doubt sorely miss. Overall, we had a lot of fun with what was overall a truly epic adventure. -Truly epic setting, stakes and enemies. I’ve not experienced this level of awesomeness in an adventure since the Epic-tier adventures of D&D 4th edition, seven or so years ago. -Very challenging even without the hard mode. - The retirement option in this adventure and what it lets you do during the final encounter is IMO very memorable. -Some very frustrating encounter design. There is seemingly overwhelming hate against non-casters in encounter 1 and enemy-spammable stunlock effects in encounter 2, which are not very fun to experience if even one save is failed. In a setting with usually random party members, at least the first one is a big problem. -There also seems to be an over-emphasis on survival and knowledge checks without any social or physical-related ones ever coming into play outside of combats, which adds a bit to the feeling that if you don’t have both a survivalist and a high-int caster, you are screwed. -The above two heavily evoke a feeling of being very reliant on the full casters in the party for success with others not contributing as much. I'd rate the combats overall a 7.5 out of 10 (challenging, but can be very frustrating, I.E. enemies literally invincible to everything outside of casters is a problem both mechanically and in player-enjoyment). The flavor/setting is a perfect 10/10, for an average rating of 8.8/10.